Settings: Printed with a Replicator 2 on .3mm/low settings, at 150% scale. Technical notes, Tinkercad flavor: This model printed very well on the Afinia H-Series printers in the classroom, but on my Replicator 2 at home things didn't go as well. Since khakerry was nice enough to make the model public on Tinkercad I could find my problem, which was that not all of the pieces sit on the platform. On the Afinia we were using raft and supports so this was not so bad, but I was trying to print the model on my Replicator without any scaffolding, so the higher pieces of the model were not adhering to the platform. This is an easy fix in Tinkercad with the Group/Ungroup, Align, and Ruler tools. If you're new to Tinkercad make sure you are fluent in these tools. In this case I ungrouped the model and moved the three rings apart to deal with them separately. Then I ungrouped each ring, resized the main part of the ring to 5mm with the Ruler, re-Aligned the holes so they could be centered, made sure that each ring was level to the Workplane, and Aligned the three rings. Notice that if we had just scaled the rings without ungrouping, the holes in the rings would have been stretched and become ovals instead of circles, so the order that you group/align/scale is important. Be careful too about the order that things are grouped and re-grouped! Sometimes you may need to group things to align them correctly, then ungroup to get your holes back for regrouping later. In the re-aligned file above I also changed khakerry's configuration of stars, since some of them were printing out too small to see, causing the printer some distress. 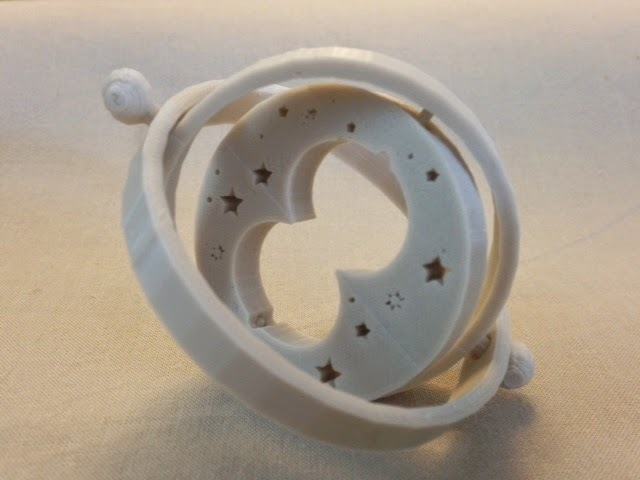 Stuff to change in the future: The remix of this model was intended to print without support, but I forgot to change the hanging-loops accordingly so there was some threading on that part of the model.